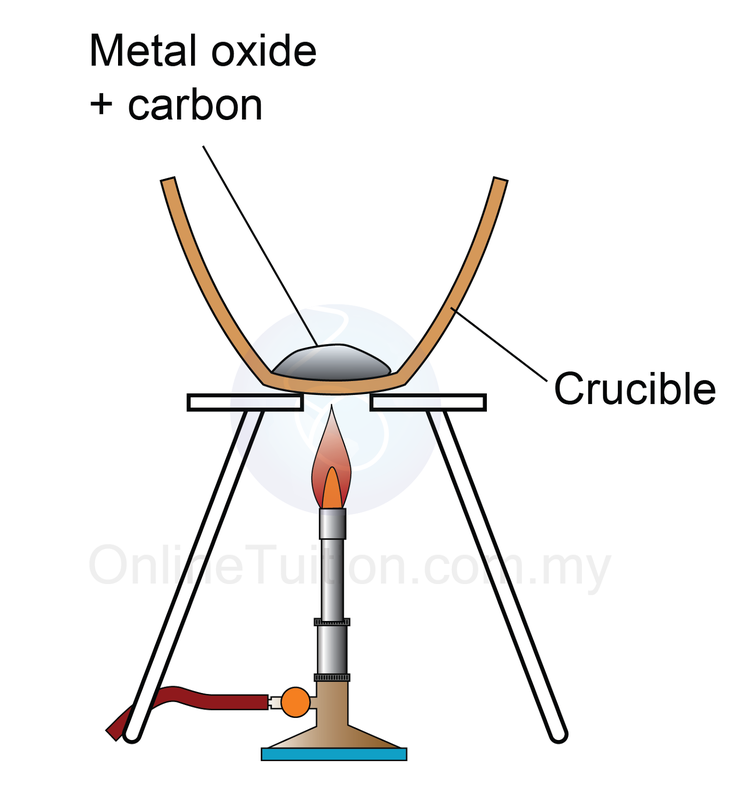 When a metal reacts with oxygen to form a metal oxide, a redox reaction occurs. Metal is oxidised to metal ions. 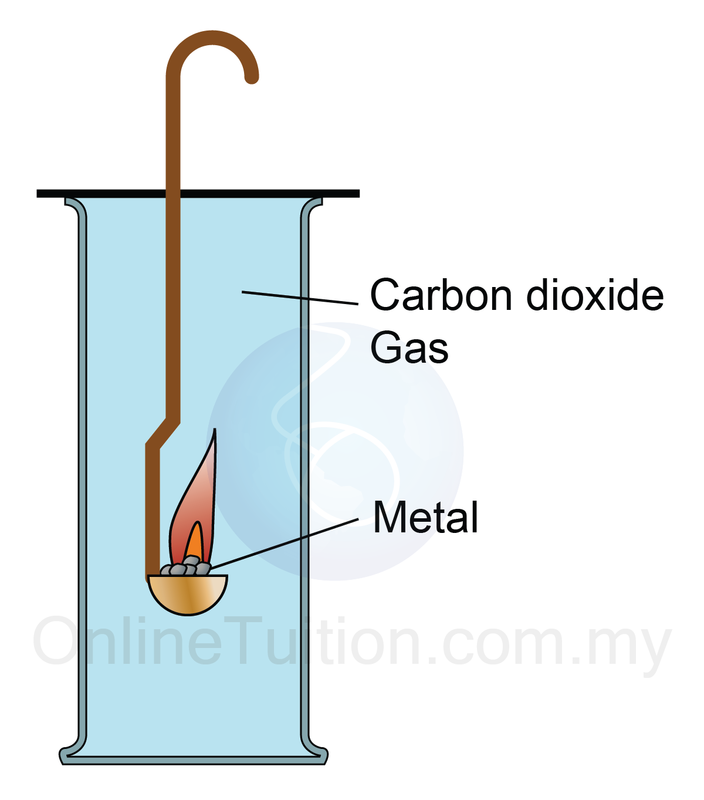 The oxidation number of the metal increases. Oxygen is reduced to the oxide ion. The oxidation number of oxygen decreases from 0 to -2. Metal acts as a reducing agent while oxygen acts as an oxidising agent. Different metals burn in oxygen with different rate depending on their differing activeness. The more reactive metal towards oxygen, the brighter and faster the combustion of the metal. The arrangement of the metal according to the tendency of reaction with oxygen to form the metal oxide is known as the reactivity series of metals. 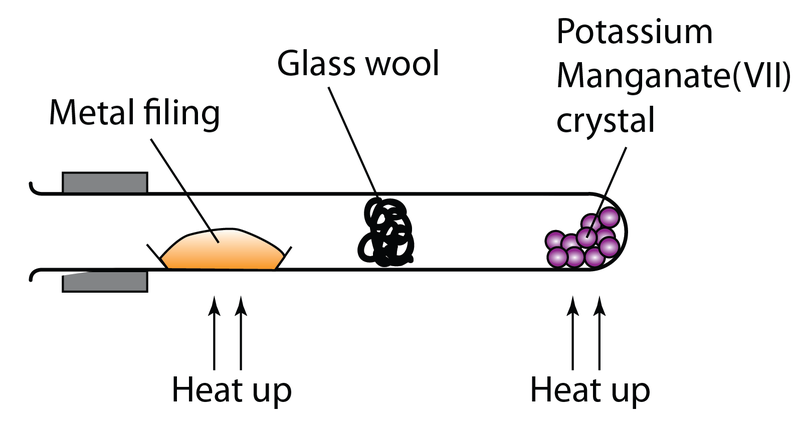 Figure above shows the experiment is conduct to build the reactivity series of metal. Table below shows the result of the experiment. Magnesium Combust quickly with a bright white shiny flame. A white powder is formed. Zinc A bright flame spread slowly. The powder produced is yellow when hot, and white when it is cold. Iron Embers spread slowly. A reddish brown powder is formed. Lead Red hot embers slowly. The powder produced is brown when hot, and yellow when it is cold. Copper Embers burn at a very slow rate. A black powder is formed. the ability of metals to take away oxygen from carbon oxide, that is carbon dioxide. If the metal can take away oxygen from carbon dioxide, then the metal is more reactive than carbon. On the other hand, if the metal cannot take away oxygen from carbon dioxide, then the metal is less reactive than carbon. Conclusion: Magnesium is more reactive than carbon. If carbon can take away oxygen from metal oxide, then the carbon is more reactive than the metal. On the other hand, if carbon cannot take away oxygen from metal oxide, then the carbon is less reactive than the metal. Conclusion: Copper is less reactive than carbon. 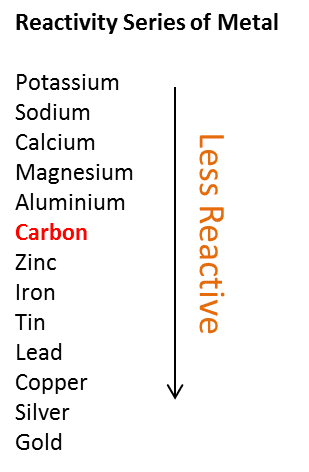 The chart below show the position of carbon in a reactivity series. The position of hydrogen in the reactivity series of metal can also be determined based on its ability to displace oxygen from metal oxides. If hydrogen is more reactive than a metal, it can displace oxygen from metal oxide, and reduces the metal oxide to its metal. Conversely, if hydrogen cannot remove oxygen from metal oxide, hydrogen is less reactive than the metal in the reactivity series of metal. Hydrogen can reduce iron (II) oxide, Fe2O3 to form iron, Fe and water. However, hydrogen cannot reduce zinc oxide, ZnO. Therefore hydrogen is below zinc but above iron in the reactivity series of metals. The diagram below shows the set-up of apparatus used to determine the position of hydrogen in the reactivity series of metal. 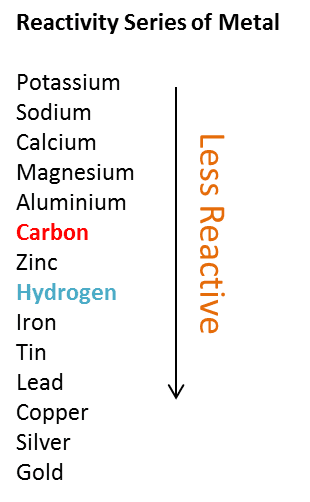 The chart below shows the position of carbon and hydrogen in the reactivity series of metal base on their ability to attract oxygen to form oxide. The method that is used in the extraction of metal from its ore depends on the position of the metal in the reactivity series of metals. metals that are located lower than carbon in the reactivity series of metals can be extracted using the reduction of metal oxide by carbon in a blast furnace. metals that are located higher than carbon in the reactivity series of metals are extracted by using electrolytic melting of metal compounds. 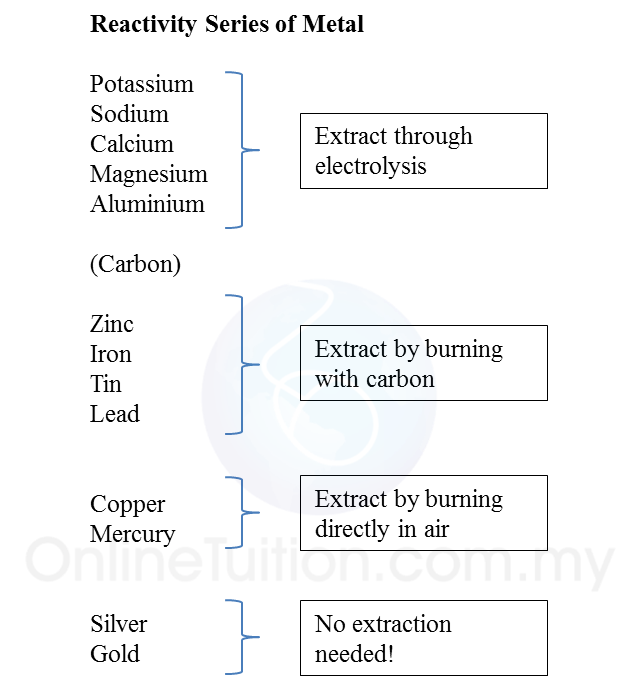 The chart below give the method of extraction of certain metals by referring to the reactivity series. Iron is extracted from its ore, that is hematite (Fe2O3) and magnetite (Fe3O4 ) through reduction by carbon in the form of carbon in a blast furnace. 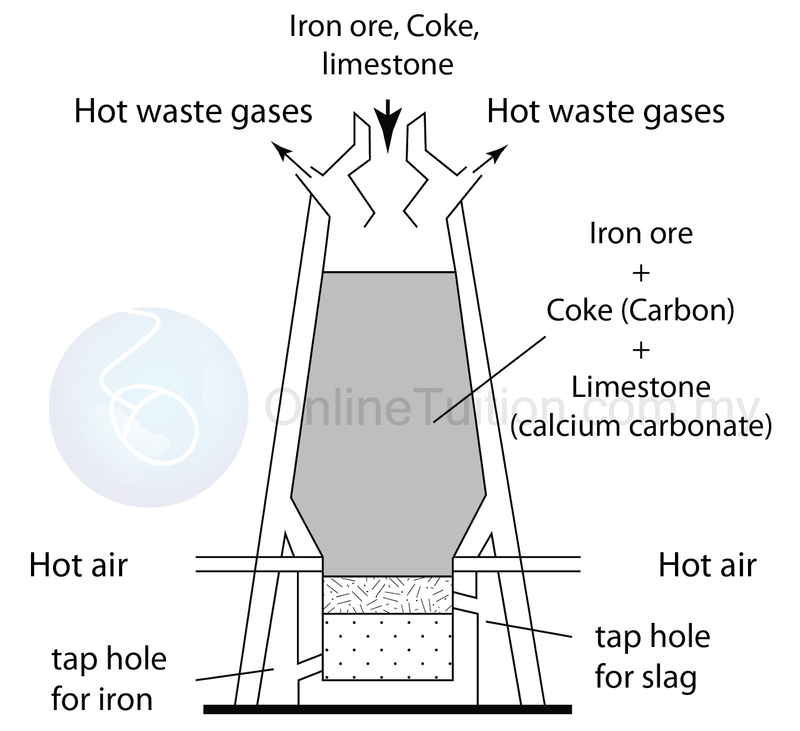 The mixture of iron ore, carbon, and limestone is entered into a blast furnace through the top of the furnace. Limestone (calcium carbonate) is disintegrated by hot air into calcium oxide and carbon dioxide gas. Carbon dioxide that is produced reacts with excess carbon to produce carbon monoxide gas which is a type of reducing agent. Carbon and carbon monoxide then reduces the iron ore to melted iron which flows to the lower part of the furnace. In the blast furnace, calcium oxide that is produced from the disintegration of calcium carbonate, reacts with foreign matter such as sand (silicon dioxide) in the iron ore to form slag. The melted dross flows down to the bottom part of the furnace and floats on the layer of melted iron. The melted iron and dross then are taken out from the furnace separately. The melted iron is cooled in a mould to form cast iron, while the dross is used to make the foundation for roads and houses. Tin exists as stanum(IV) oxide, SnO2 in the mineral casiterite, that is tin. Tin contains a lot of foreign matter such as sand, soil, sulphur, carbon and oil. Firstly the tin ore is made concentrated by the method of floatation. In this process, the ore is crushed and shaken in oily water. The foreign matter such as sand and soil drown while the tin ore sticks to the oil and floats on the surface of the water. 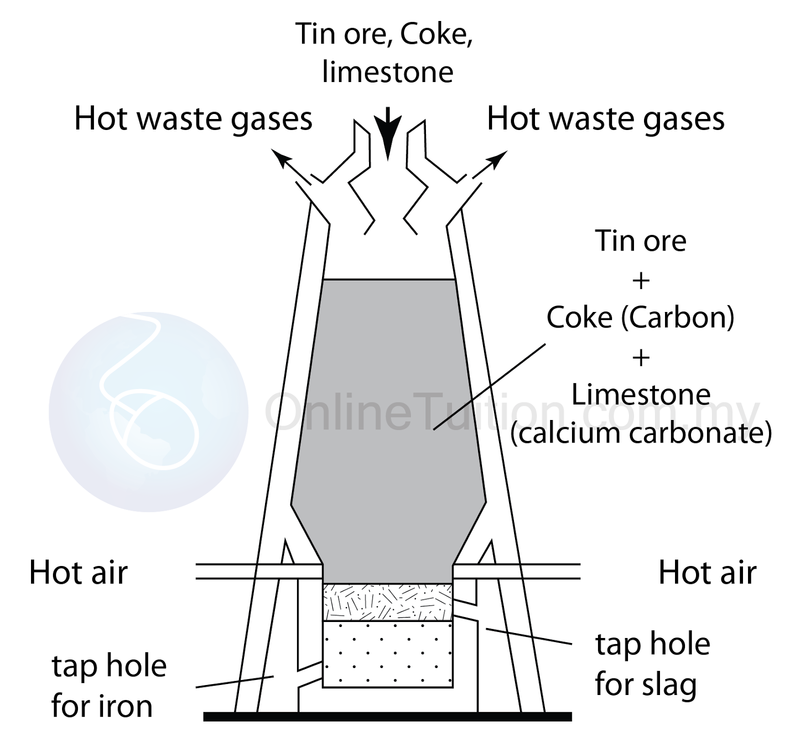 The tin ore is then collected and roasted to take away foreign matter such as carbon, sulphur and oil. Lastly, the tin ore is mixed with carbon in the form of charcoal and is heated in a blast furnace at a high temperature. Stanum(IV) oxide in the ore is reduced to tin by the reducing agent carbon and carbon monoxide. The melted tin that is formed collects at the base of the furnace and then is channeled out into a mould to form tin ingot.